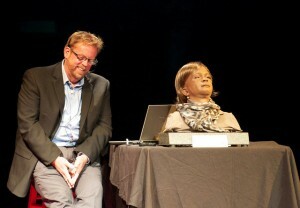 June 2013: TEDx Talk: Bina48 and Bruce Duncan talk about Mindfiles and Androids. ation, or out-of-the-box thinking. Others may equate creativity with advances in disciplines such as technology, education, economics, or leadership. We challenged you to have an open mind and ponder on the future of creativity. Sponsored by TEDx Manchester Village, Manchester 20/20, and Vermont’s Office of the Creative Economy for a lively mixing of creative minds. Vermont is a great place to create, and more and more professionals in the creative industries – film and new media, architecture, software and game development, the visual and performing arts, advertising and marketing and more – are making Vermont their home. The Terasem Movement Foundation’s www.LifeNaut.com project is mentioned in the August 2011 edition of the National Geographic magazine (click link to see article/photos). 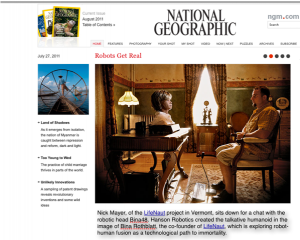 Max Aquilera-Hellweg created a beautiful two page photo of Nick Mayer, Manager of Cyberbiological Systems, Lifenaut project with Bina48 the worlds most advanced humanoid robot at our location in Vermont. It is another sign that the awareness of robots and avatars and uploading your ‘bemes’ is moving towards the mainstream of our culture conversation. Reaching out to both local and national organizations such as the National Alzheimer’s Association and Hospice Association and AARP, the LifeNaut project is offering support and technical assistance to people and volunteer organizations, who would like to learn how to use the suite of web tools at LifeNaut.com to capture and preserve another person’s life information in a digital time capsule. LifeNaut.com is a free, safe and secure online space that allows anyone to upload videos,audio recording, images and documents that describe a person’s unique experiences,memories, values, attitudes and beliefs. You can even create and interactive avatar. Volunteers who work with people facing memory challenging conditions and end of life issues are being given priority. To get in involved or learn more about the LifeNaut LifeSaver Volunteer project contact us at Terasem@gmavt.net. You can check out the website at www.LifeNaut.com. WWW.Lifenaut.com, is a project of the Terasem Movement Foundation, aimed at offering a form of digital immortality. The Lifenaut project recently launched a fully new version of its award winning website. The new site focuses on helping users create an Artificially Intelligent based Avatar, that with some time and effort may one day be able to pass the Turing Test, where humans cannont tell the difference online whether they are interacting with the real you or your avatar. Featured in the June issue of New Scientist Magazine www.lifenaut.com and its avatars were described at part of the next step of the internet revolution, the coming of intelligent avatars. Cannes, France – Terasem Media and Films in collaboration with Transformer Films presented its feature sci-fi thriller: “2B:The Era of Flesh is Over” at this year’s Marche Du Film. In the near future, the first techno-human commits a crime to show that the era of the flesh body is over, that even “death is dead”. SHORT SYNOPSIS New York, soon. Technology’s exponential growth is fast and furious. Human life is in the process of being transformed. Mankind stands on the verge of re-engineering its biology—merging with the incredibly intelligent machines it has created. Mia 2.0, the world’s first ‘Transbeman’ and her inventor, the eccentric Dr. Tom Mortlake, conduct a bold political experiment designed to prove that human reliance on the fragile flesh body is over and ‘eternal life‘ is at hand. THE BUZZ The script is based upon real science and evolving technologies. The ‘techno-human’ conundrum is the hottest and most controversial topic of this century. This film is an entertainment designed to jump-start the conversation about the moral and religious questions raised by the bio-tech revolution. BRISTOL, Vt.–(BUSINESS WIRE)–The Terasem Movement Foundation Inc., creators of the award winning digital immortality website Lifenaut.com, announced the History Lives Project ™. This free, web-based project offers digital imaging & “artificial consciousness” technology that allows anyone with a PC and an internet connection to participate in bringing Abraham Lincoln, Gandhi, Charles Darwin and other historical figures back to life. Created by an international software development team based in the United States and the United Kingdom, the History Lives Project™ is designed to make it possible for anyone to participate in the creation of interactive digital clones of past historical figures. Imagine having a conversation with Abraham Lincoln instead of just reading about him, or interacting with Gandhi about non-violence and other lessons from his struggle for India’s independence from British rule. Listen to Harriet Tubman speak about her life as an anti-slavery activist or Susan B. Anthony share her thoughts on Women’s Rights before getting the right to vote. A chat with Mozart anyone? Using tools available within Lifenaut.com, groups and individuals will pool their knowledge and efforts to build the “mind file” for a digital representation of Abraham Lincoln, Susan B. Anthony, Harriet Tubman, Charles Darwin, or Gandhi will able to carry on speech and text conversations based on information accessed by custom built artificial consciousness software. A “mind file” is a digital archive that represents the unique knowledge, values, mannerism, beliefs and behavior of a person- in this case, an historical figure. Overtime, each “digital clone” will become more and more true to the original. The project also invites people to propose other historical figures for “re-animation”. 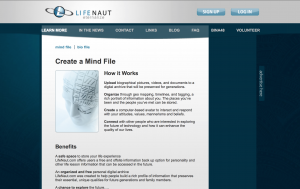 The project is funded by the Terasem Movement Foundation Inc., which in October of 2007 launched Lifenaut.com, the first free digital immortality social networking site to explore the possibility of creating robust “mind files” or digital archives of a person’s life that can be used in the future to re-create a digital clone. To get involved or learn more, visit History Lives at Lifenaut.com. Talk with Your Lifenaut AI Avatar! Exciting stuff! With the new release of MacSpeech Dictate (http://www.macspeech.com/) you can now speak in natural language with your Lifenaut AI Avatar. Simply purchase the software, which comes with a very nice wearable mic, follow the installation directions, spend about 5 minutes reading to it so it can learn your voice’s idiosyncrasies, and you are ready to go. Log into your lifenaut account, go to your AI Avatar and start speaking! Our experience is that this is an even more powerful speech to text engine than Nuance’s Dragonspeak and the learning protocol is much quicker and easier too. Try it out! We are expecting to launch Phase II of lifenaut.com within the next 2 weeks. Phase II introduces a whole host of new features including automatically generated timeline and map views of the files that you upload into your mindfile; and a new Social Connections page in which you create a 3D rotating model of everyone you know! It’s all 100% free at lifenaut.com. We are also looking for guest bloggers, so if you are interested in writing a blog for this site, please send us an email: terasem@gmavt.net.